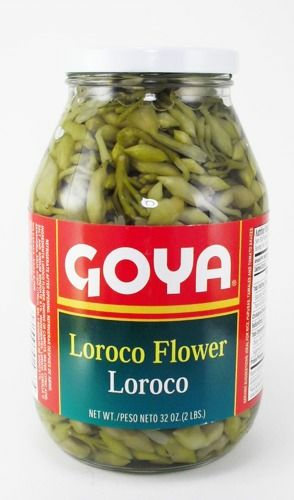 Goya Loroco Flower - Loroco Flower is native to Central America, It's a perennial plant. Loroco is a vegetable, actually a flower bud that are harvested and used in Salvadorian cuisine, Guatemala and some other countries in Central America. The flowers have a unique, pungent flavor that is used in pupusas, mixed with rice, soups, tamales, pizza and tomato sauces. It its Goya, its got to be good! Ingredients: Loroco Flower, onions or carrots, water, citric acid, salt and sodium benzoate 0.1%. Ingredientes: Loroco, cebolla o zanahoria, agua, acido citrico, sal y benzoato de sodio 0.1%.